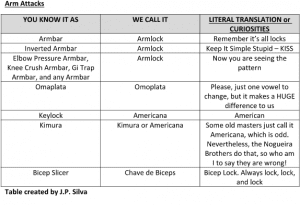 If you have a Brazilian instructor or if you have ever been to a seminar by a Brazilian, I am sure you heard some submissions with different names. 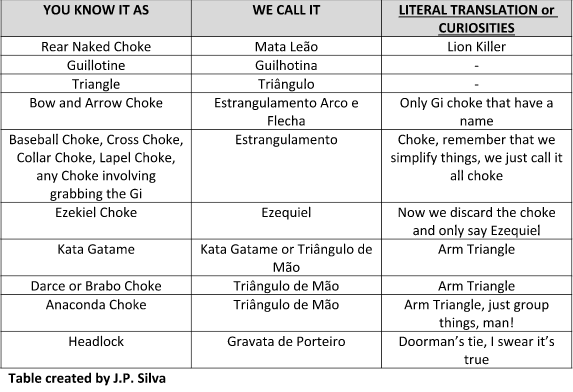 When the Gracie brothers started spreading the art in the United States in the late 70s, some names of positions were adapted to American culture and lost their original meaning in Portuguese. I am going to tell you the various names of the most famous submissions in Brazil; some of them are very funny. 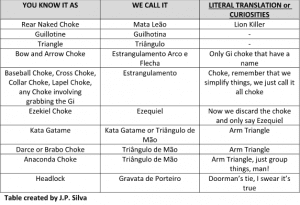 We Brazilians do not name everything. The majority of of the time, we just group moves in some broad definition. When I watch an instructional or a YouTube video, every move has a name. For example, if we are working deep half guard in the week, the professor won’t say, “Mates, today we are going to learn the Outside Hook Sweep!” No, it’s just, “Mates, today we are going to learn a deep half sweep.” The next day, “Today we going to learn ANOTHER deep half sweep.” Moreover, if you learn three sweeps that week, you refer to the sweep by the day that it was taught. “Professor, I am having trouble with the sweep you taught us Tuesday. Can you help me with that?” I know it may sound a mess to you, and it is. However, it is our way of thinking and learning. If you teach a class with many names in Brazil, the students would be confused. You will see that we simplify the names, sometimes dropping the different names altogether. We really like the word “lock”. Everything is a lock. 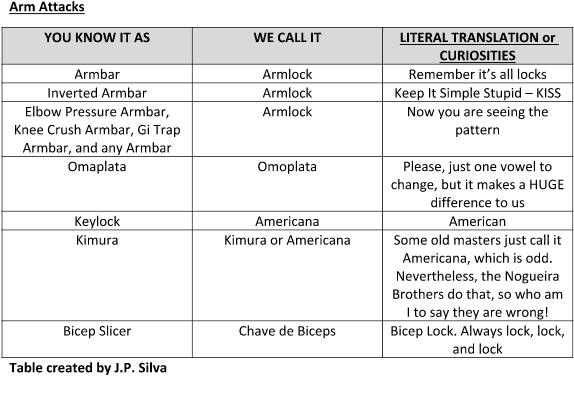 By lock we mean a joint lock, so continuing with this theory of simplifying names and grouping different positions in the same group, we just put the lock with the limb and that’s it! No arm bar, arm lock. No calf slicer, calf lock. 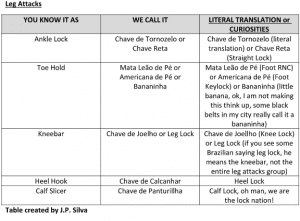 Now you know how to add a Brazilian flavor to your BJJ. 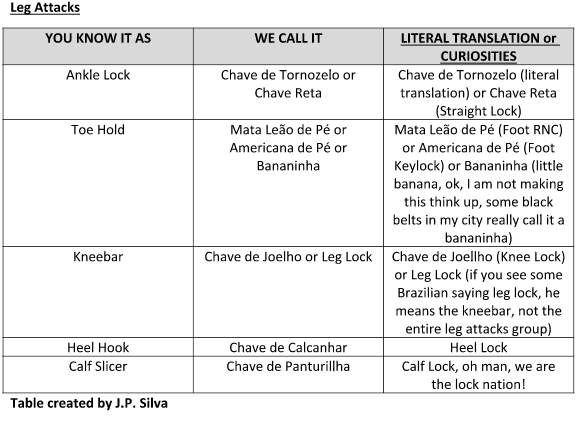 In case you forget the Portuguese name of a submission, just use my two tips: name the submission in a broader group or put “lock” in it!